Finally blue skies and sunshine greeted the teams at the Circuit De Catalunya this morning as the teams were excited to get going under more familiar conditions. The teams completed 546 laps in the morning session alone which is close to the total laps achieved across the whole of last Monday. 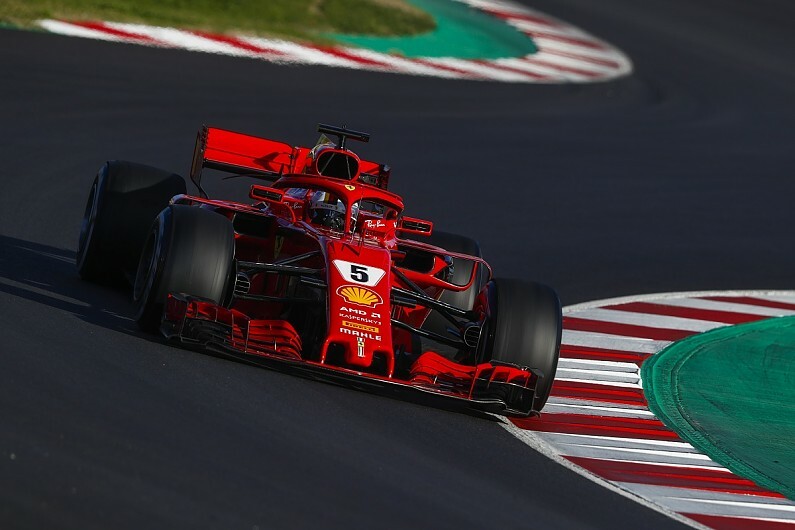 It was Vettel’s turn to steal the show today with 171 laps, not far off three race distances here in Spain, and a table topping time of 1m20.396s set on the medium tyres. A solid day for Ferrari who went toe to toe with Mercedes all day. The Silver Arrows gave their drivers half a day each and finished 2nd (Bottas) and 4th (Hamilton) completing 177 laps between them. With Bottas just 0.200s off Vettel it’s shaping up to be mighty close at the top. Splitting the two Mercedes was Verstappen in the Red Bull. The Renault powered outfit are just about keeping up with the big two but reliability issues continue to cause concern. The Red Bull broke down on track with an hour and a half left and needed a trip on the recovery truck, tainting what was a very positive day. Verstappen did make it back out for the last 15 minutes of testing which will alleviate concerns amongst the Red Bull faithful. Despite the time in the garage Max still ended the day on 130 laps and 0.253s off the lead which will keep fans dreaming of a three team battle at the front. Looking further down the grid only adds to the concern as Renault powered teams continue to struggle. McLaren suffered a further set back as Vandoorne broke down three times throughout the day. A hydraulics failure and two electrical problems caused the McLaren to stop dead twice on the track and once in the pits. Only managing to get round 38 times ended a very disappointing day in the midst of a very up and down testing for the team. We still don’t really have any idea where they fit into the grid or if they will be able to get the car all the way round in Melbourne. The works team Renault on the other hand went relatively unnoticed today which is probably a good thing. 139 laps between the two drivers is respectable and there is still three days left to try and close the gap to the top three. At least there were no breakdowns in the Renault garage. Everyone likes an underdog and I think my new favourite team is going be Toro Rosso. They encountered the teams first stumbling block today as the screens were pulled across the garage in the afternoon to fix a break system issue but Gasly still completed 52 laps and posted the 5th fastest time of the day. You would have to think there’s a few McLaren employees questioning the switch to Renault with Red Bull licking thier lips at the thought of a Honda engine with another 12 months development. Magnussen again showed some pace in the Haas and this time managing to complete nearly a century of laps. A productive day for Magnussen ending the day above Sainz and Hulkenberg on the timesheet in 6th. Force India continue to go under the radar, Perez managed to get 93 laps on the board but finished the day in 10th. With Williams and Sauber making up the grid, each recording over a century of laps without showing much pace. The action is starting to heat up and as the weather allows the teams to do longer runs and push the cars further the flaws begin to show. We were hoping for some quicker times today but the focus still seems to be on longer runs but I still believe we will be in the 1m17s by the end of the week. Keep the sunshine coming Barcelona and we might just have a race in Melbourne instead of an experiment.